Observing the architecture of SOHO China, one of the largest prime office real-estate developer in China, is akin to taking a glance into the future. The sleek, fluid designs of the buildings resemble the architecture one might find in the Star Wars or Star Trek universe. And this ultramodern feel is exactly what Zhang Xin, CEO and Co-Founder of SOHO China, intends to create. “The role we play is to introduce the most innovative designs from all parts of the world and bring them to China,” she said, after showing her audience a two-minute clip of her company’s recent projects in Shanghai and Beijing. A renowned business leader repeatedly ranked amongst the “World’s Most Powerful Women,” Xin is acclaimed for bringing cutting-edge international architects to design iconic landmarks for Beijing and Shanghai. Her personal story emblematic of the “Chinese dream” has made her a social media celebrity with over 10 million followers on Weibo the Chinese version of Twitter. Xin began by recounting the founding of SOHO China. The year was 1995, and China had not yet embarked on its rapid path of development. “There was hardly an urbanized part of China,” she mentioned. SOHO China found its identity in 2000, with the advent of the Internet and the entrepreneurial excitement that followed. Small scale start-ups formed in abundance around China, and these burgeoning business needed a space to work. Xin wanted to design real-estate that could conveniently house these small enterprises. The name SOHO comes from the phrase “Smart Office, Home Office” because Xin decided to combine office rooms and residential apartments in the same building to facilitate a comfortable and productive environment. “SOHO merged work and home space to meet the need of society and the need of the market. Early on, there was such a need to upgrade infrastructure and move into better homes and offices,” she explained. Although SOHO China has expanded beyond its original concept, its commitment to supporting the increasingly technological culture of the times remains. Now, the company upholds two pillars: globalization and digitization. Globalization, in this context, means recruiting the most talented architects from around the world to SOHO China, and digitization means incorporating the newest technological developments into the architecture. SOHO China’s modern design is not just aesthetically advanced, but, according to Xi, it also affects the way people live and work for the better. “You behave in certain ways in certain spaces. If you go to a more modern space you behave differently,” she shared. Xi, however, does not think that the old should always be scrapped for the new. She sees an advantage to having an urban landscape with multifaceted types of buildings. But that does not discourage her from thinking that SOHO China’s properties are especially revolutionary. She believes they will be as significant to China as the Great Wall and the Forbidden City. “We discovered the character of our architecture supports the culture of our time. The Great Wall was built for defense, and the Forbidden City as a palace, but today, they are windows into ancient history. What we’re building now will in the next 50 and 100 years serve that same purpose,” she confidently declared. Born in Beijing, Zhang Xin moved to Hong Kong at age 14 where she worked as a factory girl for five years before making her way to England. She holds a Bachelor’s degree in Economics from Sussex University, a Master’s degree in Development Economics from Cambridge University and an Honorary Doctor of Laws from Sussex University. 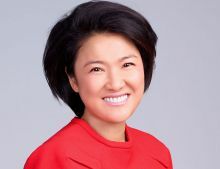 Zhang Xin sits on the Global Board of Advisors for the Council on Foreign Relations, and is a member of the Harvard Global Advisory Council. Deeply involved in philanthropy, Zhang Xin and her husband Pan Shiyi established the SOHO China Foundation in 2005, a charitable organization that promotes education to improve social mobility, and in 2014 launched the SOHO China Scholarships, a US 100 million initiative to fund financial aid scholarships to Chinese students admitted to top international universities. Zhang Xin and Pan Shiyi are also members of the Breakthrough Energy Coalition, a group of global business leaders brought together by Bill Gates to invest in technologies that will transition the world to a zero emission energy future.